Viatera® is a beautiful non-porous material that is more hygienic and stain-resistant than other stone counter top materials such as granite. 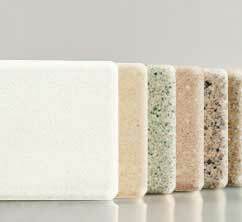 And unlike granite, Viatera® Quartz does not require sealants to maintain its non-porous characteristics. So, it is approved for use in food service, medical facilities, schools, hospitality and other businesses where long-lasting durability, hygiene and design flexibility are essential. Visit the LG Hausys Viatera website.